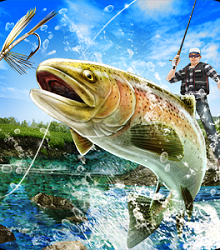 The fly 3Dll fishing game is challenging. This game reminds me of the Nintendo fishing game. It seems like you are really fishing except on your couch. The challenging part is catching the fish. It takes time to catch fish. You have a choice of different hooks and lures. Some fish look bigger than other fish which is normal. I’ve been playing for an hour and still not caught any fish but I want to keep going until I do. I think the hardest part is reeling in the catch. The fish doesn’t stay still and you can only reel when the fish is in the square on the screen. It also reminds me of the Xbox fishing games as it has the similar graphics.